Molded from high-density polystyrene with a liquid-applied waterproof coating, these niches are waterproof, durable, and ready to tile. Great for all areas of the home, indoors or out, these units are not limited to the bathroom, and can be installed to provide an extra accent in foyers, kitchens, bar areas, as well as outdoor entertainment areas. When used in combinations of more than one, or with other available sizes, these niches can create unlimited design possibilities. They can also be rotated 90 degrees to provide side-by-side shelving applications. 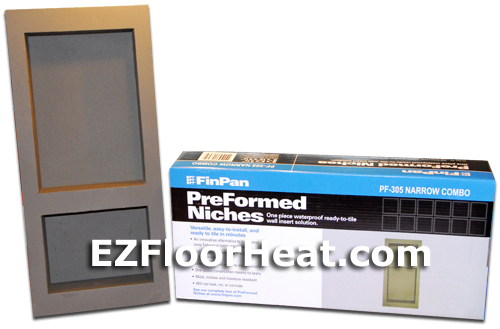 With a 1/2" thick flange, these niches will flush with any standard 1/2" backer board for easy installation and tiling.